When it comes to your press release, blog post, web page, or anything else you plan to publish online, it is essential that you have focused SEO efforts. However, there are certain SEO elements that are essential, while others are not as important. 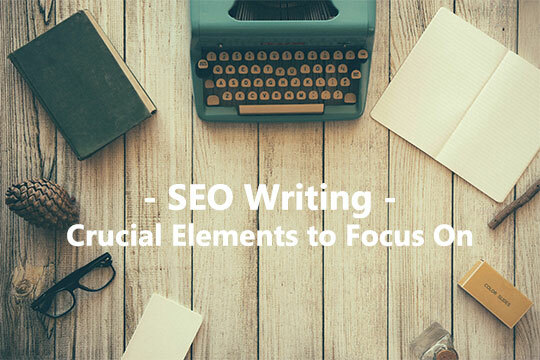 Knowing what you should focus on is essential, and some tips to help you with your SEO are highlighted here. Remember, in some cases, hiring a professional SEO company may also be quite beneficial in your marketing efforts. No matter if you decide to optimize right away or down the road, you need to know the keywords that you are targeting and include them in the content’s title. It is generally accepted that the keywords should be as close to the beginning of the title as possible, but the ultimate goal is to ensure they are in the title. When you write your copy for SEO, it is not just about how you rank. It is also regarding the presentation of the content that appears in the search engines. The content’s meta description will typically be a “snippet” that appears below the title in a search engine, which will influence whether or not you get a customer to click. When you create content that is unique on a regular basis, it will make the search engines happy. However, you know that. For the purposes of search optimization, and being reader friendly, it is essential that your content is on-topic and tightly centered to the subject matter of the keyword phrases you are focusing on. Recommended: How to Write SEO Content? The keyword frequency refers to the total number of times that you have targeted keywords appearing on your page. The keyword density is the actual ratio of these keywords to the remainder of the words on your page. Generally, the frequency of the keyword will impact the ranking. However, you need to avoid a ranking over 5.5 percent or it may result in you being labeled as keyword stuffing. In essence, search engines can detect when an article has been written in a way that involves simply stuffing as many keywords into the article as possible. Instead, write the article (or, better yet, have an SEO specialist write the article for you) to feature a certain density (percentage) of your keyword, while still sounding natural. The fundamental basis of the internet is linking. Search engines want to understand that you are connected with other content and pages so when you link out to other pages, it will enhance your search engine optimization efforts. Link building refers to the practice of getting other pages related to your business to link to your website. That way, you can increase the traffic to your site through the links click on by visitor’s to that other site. This is a positive way to increase your search engine ranking and, as a result, to bolster your site’s visibility. For example, say you create a great article on the “10 things every college freshman needs to have in his dorm room.” Because their target audience may find your article useful, colleges may post a link to your article on their website or blog. That will help to drive targeted traffic to your site. If your site sells those items mentioned in the article, there’s a good chance that some of those visitors will purchase them. The fact is that there is no shortcut when it comes to SEO. You have to do it right and follow the rules or the penalties may be harsher than you expected, hurting your ranking significantly. SEO is not something you can just decide that you want to do one day. You have to learn the rules of the game – and then follow them – if you want to be successful in your endeavor. Failing to do this can lead to a number of issues, including getting your site blacklisted. Avoiding this is simply when you allow good SEO professionals like Celerify to help you out. They know what to do and how to do it to help you be successful.